[Source: Arizona Indicators] — What will determine Arizona’s future? How economically competitive are we? How well are we educating our children? Are we maintaining the advantages of our climate and natural environment? Right now, Arizona isn’t sufficiently equipped to answer such questions and, therefore, to make informed decisions. By providing quality data in accessible formats with clear, visual explanations via a transparent data analysis process, the Arizona Indicators Project is working to facilitate discussions on the state of our communities today so informed decisions for tomorrow can be made. Topic areas include: Economy, Education, Innovation, Sustainability, and Quality of Life. [Source: Jahna Berry, Arizona Republic] — Mayor Phil Gordon’s annual speech on October 17 on downtown Phoenix was carefully staged to spotlight blockbuster city projects, but the shaky economy stole the show. The mayor spoke at a $350 million city-financed hotel that opened Sept. 30. Afterward, he took some residents and key political and business leaders for a surprise spin on Metro, the $1.4 billion light-rail project expected to open Dec. 27. Tough financial times, however, have knocked out many of the forces that made boom-time projects — such as new condos and office buildings — possible, city officials and experts say. [Source: Casey Newton, Arizona Republic] — Early-morning and late-night bus hours will be eliminated and Saturday service reduced in Phoenix as the city makes unprecedented budget cuts. 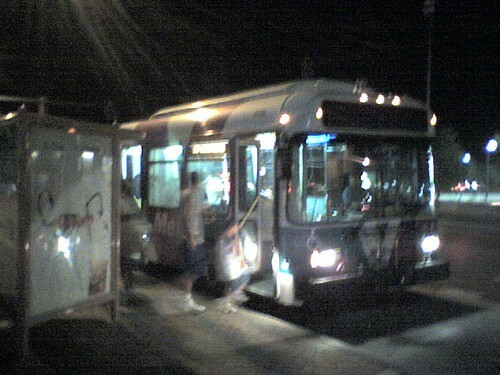 On Tuesday, the City Council voted unanimously to eliminate all trips before 5 a.m. and after 10 p.m. In addition, Saturday service will be reduced to match Sunday levels, a reduction of 24%. The reductions go into effect Dec. 29, leaving thousands of people to find new ways of getting from place to place.